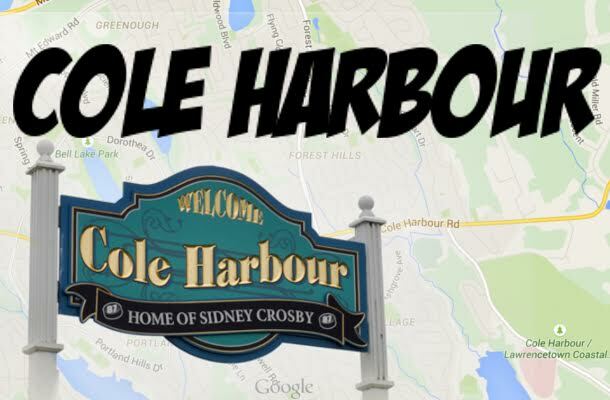 I realize that Cole Harbour is not technically part of Dartmouth, but it makes sense to include it within the Dartmouth Pizza Quest, so here it is! Much thanks to our hosts, Ann & Gil for their wonderful hospitality! Ann’s watermelon agua fresca and rhubarb pies almost stole the show! 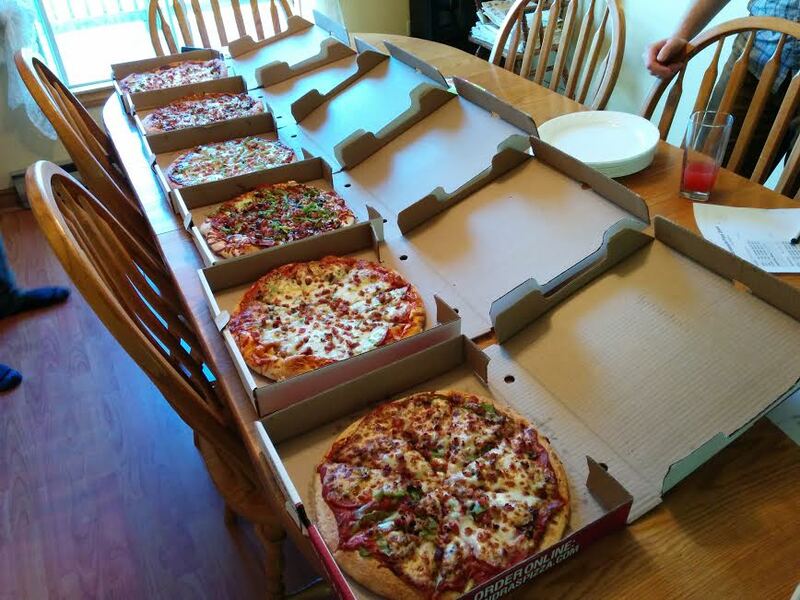 These pizzas were scored for sauce, crust, cheese, toppings and overall. Each participant was also asked to name their top 3 picks, and declare their favourite. All of this information was analyzed in order to determine the top 3 pizzerias in Cole Harbour. 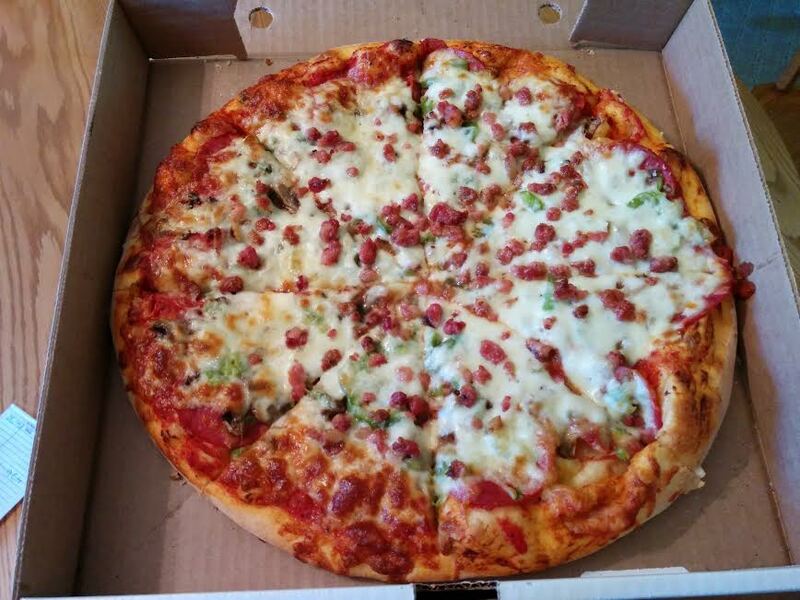 I had never had Alexandra’s Pizza other than at the original Queen Street location, but this product was consistent with my past experiences. Alexandra’s best scores were for cheese and toppings, but this was still an average performance. Opinions were split about the sauce. Gil and Ann did not like the sauce, describing it as “off or weird” or having “too much tang”. I personally didn’t mind the sauce. It is the oil flavour in the crust that I don’t like. 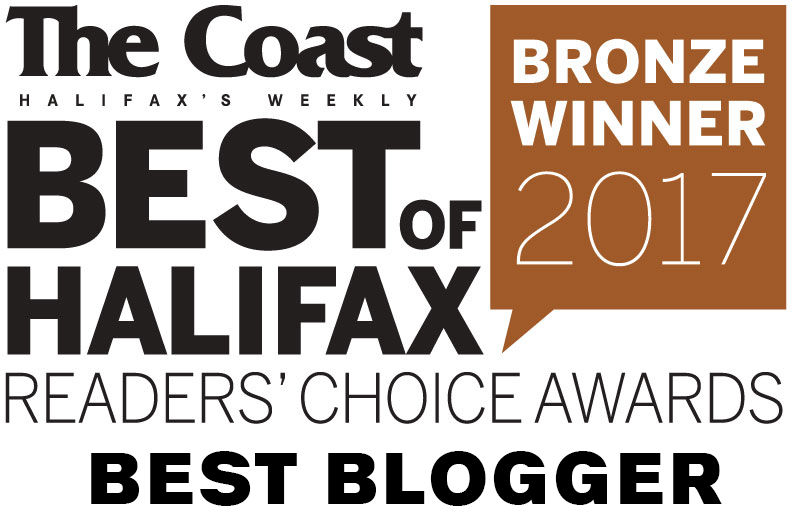 Despite a #2 finish in the South End Halifax quest, Alexandra’s rated poorly overall for Cole Harbour. Anapolie Pizza got 1st place for Sauce and 2nd place for Crust. Denton wrote of the sauce: “Spiced, but not overwhelmingly spiced sauce. Rather light application of it, though”. Ann wrote: “I was surprised by this pizza. I enjoyed it. The crust is better than I remember”. Indeed, the crust was one of Anapolie’s best attributes. Despite Denton’s claim that Anapolie had the best pepperoni, I couldn’t get over the chewy bacon balls. I’m not a fan of this abomination of bacon identity in the first place, but Anapolie’s bacon had this chewiness that just turned me right off. 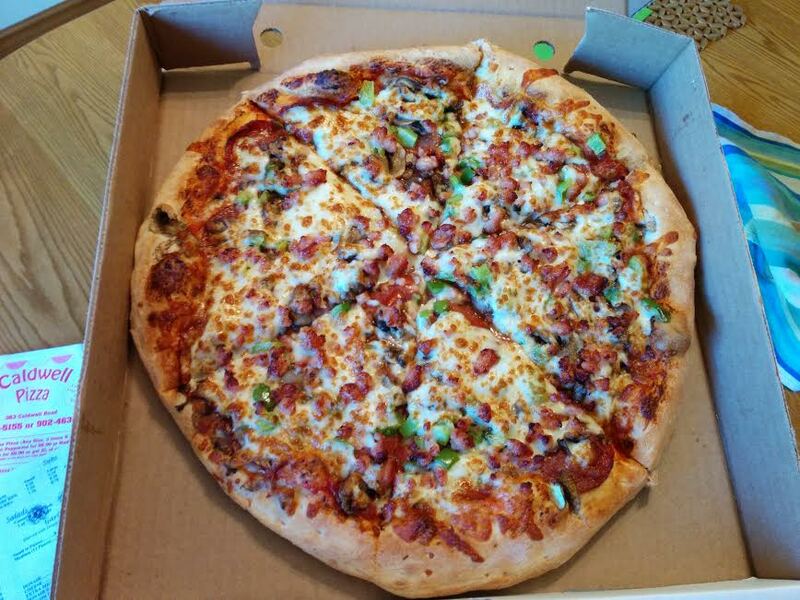 This was Mike’s favourite pizza of the evening, and was mentioned 4 times as a Top 3 Pick. My parting words were: “This seems like it should be better than it is”. The main problem with Basha Pizza was the aesthetics – the pizza looked like it was removed from the oven prematurely. At first I rated this pizza relatively poorly, but on a second inspection I realized it was actually quite flavourful. The aesthetics were affecting how I experienced the flavours of the pizza and I had to overcome that! 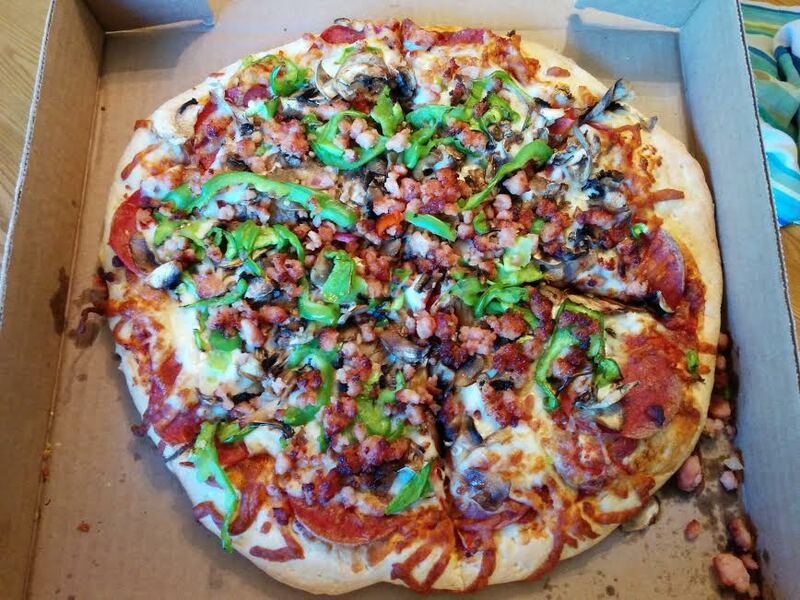 Unlike Anapolie, this bacon had no textural problems and it contributed to the flavour profile of the pizza. We liked the long strips of green pepper, and Basha managed to take 3rd place for Crust and Cheese. Some people felt that the sauce wasn’t plentiful enough, but the overall flavours were appreciated. The toppings were indeed plentiful and except for the pepperoni they were all on top of the cheese. Mushroom lovers rejoice! ReTales and I loved the topping-forward flavours. You could taste each and every topping, including the oft neglected mushrooms! Opinions were split, though. Ann felt that putting the toppings on top of the pizza dried them out. Caldwell still took 1st place for Toppings – with a big lead! However, Caldwell got a poor score for its crust. It was kind of thin and deflated, with telling dolly roller marks. Mike noted that the sauce had a “good herbal note” but agreed with others that there wasn’t enough of it. There was an acceptable amount of cheese under all of those toppings. If it wasn’t for the weak crust, this would be a damn good pie. Still – more people picked Caldwell for their #1 pick than any other pizza. Those who liked it, liked it a lot. Ronnie’s is a pretty basic, non-offensive pizza. As ReTales wrote: It’ll “…pass with a 6 pack”. However, Ronnie’s was appreciated especially well for its sauce. My notes indicate that it had a “nice zesty sauce” and lots of it. Even sauce-loving Mike thought it had a good amount of sauce, and also gave props for its “great topping coverage”. The cheese was deceptively lacking, and it came off with the pepperoni when I bit into it. I think Ann sums it up best: “An overall good pizza. The crust could have been better and more cheese would have been nice”. Sasy’s Pizza is Gil & Ann’s go-to pizzeria so they were maybe a little biased. But I think the bias was warranted. Sasy’s was the cheesiest pizza of them all. It was also the largest AND the cheapest! The crust was a little overcooked, which lost it a point from ReTales who apparently got one of the charred slices. But people generally enjoyed the crust, which was thick, crispy, and soft in the centre. This was the only crust that I just wanted to keep eating and eating. There wasn’t enough sauce, which gave it that sort of pasty texture between the dough and the toppings. The toppings were adequate. Denton spoke highly of the pepperoni, and I made a note of the fresh peppers. This pizza was definitely a crowd pleaser. Those who liked Caldwell also generally enjoyed Sasy’s, whereas those who enjoyed Sasy’s didn’t necessarily enjoy Caldwell which is how Sasy’s took down the win. Caldwell lost points even from its supporters due to its lackluster crust. 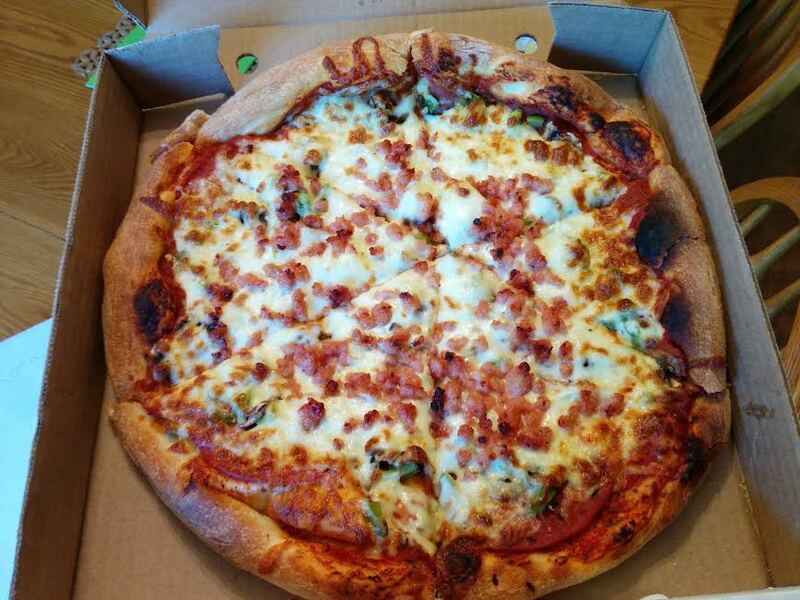 I think Caldwell is attractive to people who really like a toppings-forward pizza, whereas Sasy’s caters to those universally adored qualities of size, crust and cheese. And you can’t beat the price for what you get. Personally, I would have to try Anapolie again without the bacon to have a conclusive opinion. I would also like to see if Basha Pizza was having an off day, and whether Caldwell Pizza was souped up to impress first time customers. 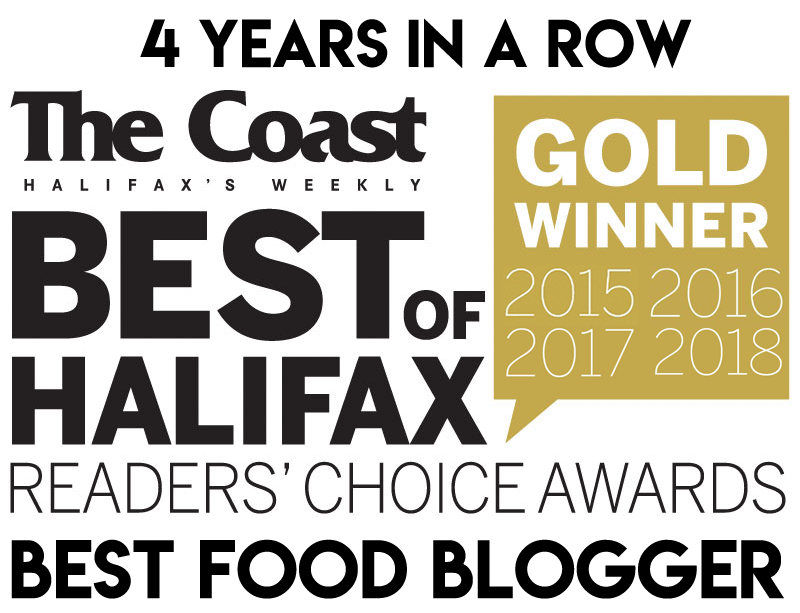 We’ll be visiting Ronnie’s again when we do East Dartmouth. I don’t think we’ll revisit Alexandra’s again – unless somebody can convince me otherwise. But what do you guys think? 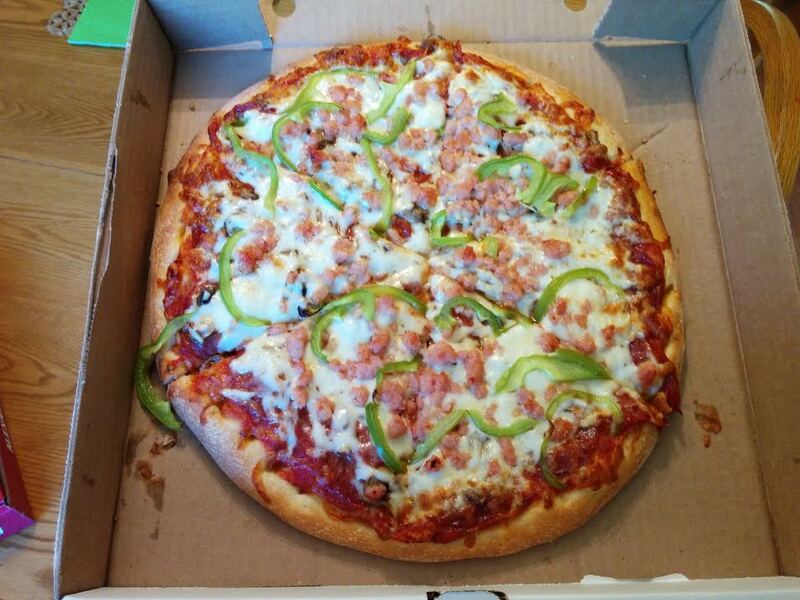 What is your favourite pizza in Cole Harbour? Were our experiences with these pizzerias characteristic? Let me know in the comments! So fun!! If you ever do a CH quest again, our door is always open. I may have to give sassys a try! Thanks for the tip! Will have to reevaluate Anapolie – was just talking about this today actually! 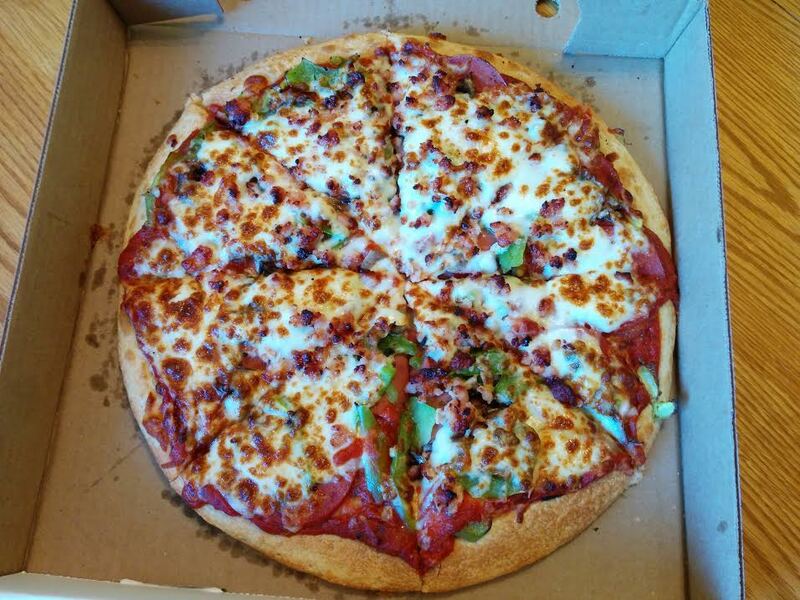 Sasy’s is our regular goto pizza. Tasty’s on Main is also a good choice. Absolutely hate that pre-made crust!